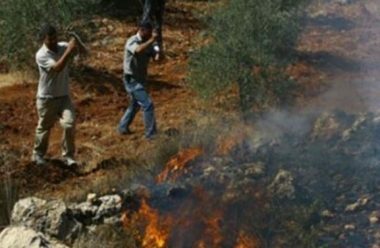 A group of extremist Israeli colonizers burnt, on Friday evening, dozens of Dunams of Palestinian Olive orchards in Burin village, south of the northern West Bank city of Nablus. Ghassan Daghlas, a Palestinian official who monitors Israel’s illegal colonialist activity in the northern part of the occupied West Bank, said dozens of colonists attacked the village, and invaded olive orchards, before setting dozens of trees ablaze. He added that the attack, committed by fanatics from the illegal Yitzhar colony, is not the first, as they have carried out numerous similar attacks, in addition to dozens of assaults against the residents and their property. Israel’s colonies in the occupied West Bank, including occupied East Jerusalem and around it, are illegal under International Law and the Fourth Geneva Convention to which Israel is a signatory, and a constant violator.